Moo Cow Records - MC29 The Ultimate Warriors / Abathakothie split 7"
MC29 The Ultimate Warriors / Abathakothie split 7"
1000 on black vinyl. 100 on blue vinyl. I approached Jamie Getz of Outcome to see if they were interested in releasing a new record on Moo Cow. It was at that time I found out they had broken up, BUT he had a new band called Abathakothie. After listening to some of their noise material we discussed releasing some of it, but I wasn't prepared to do a full release of the noise material. It turns out, he wanted to help a local band named The Ultimate Warriors. Having not released a powerviolence band I was intrigued, and the record was planned. Unfortunately, it took much much longer to get the UW tracks from the band than was agreed upon, but when I did, The Ultimate Warriors had their debut release on Moo Cow, these Ultimate Warriors tracks were released on the Moo Cow Records #47 CD. From The Ultimate Warriors / Abathakothie split 7". 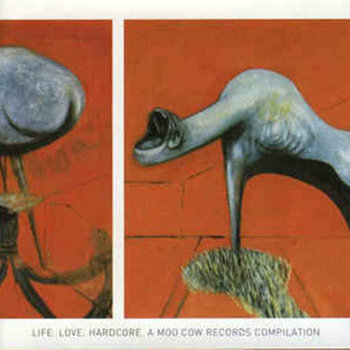 Moo Cow Records #25.